Measles; Child; Syria; Steroids; Oman; Vaccination; Encephalitis. Measles is a highly contagious viral infection that is transmitted via airborne droplets from the nose, mouth, or throat of an infected individual. The infected person becomes symptomatic 10–14 days after exposure. Initial symptoms include high fever, runny nose, bloodshot eyes, and tiny white spots on the inside of the mouth (Koplik spots). Several days later, a rash develops, starting on the face and upper neck and gradually spreading downwards. Worldwide, many young pediatricians do not encounter measles cases or deal with its complications. The World Health Organization (WHO) classified Oman in 2013 as one of the countries close to elimination of measles.2 In this report, we describe a Syrian child who presented in Oman with measles encephalitis and made a full recovery. A seven-year-old Syrian girl was admitted to a regional hospital in September 2013 with an altered level of consciousness and inability to walk. She had fever and rash a week before admission. The rash started behind her ears and then spread all over her body. This was associated with conjunctivitis and a mild cough. She continued to be highly febrile; two days before admission, she was unable to talk or move and appeared to be sleepy all the time. A history of a similar illness with fever and rash in her siblings since August was given. The child and her siblings were not vaccinated. She was born in Oman and moved to Syria at the age of two months and, due to the war, the family came back to Oman. They were living in an area with other Syrian families who also had individuals with a history of fever and rash around the same time. The parents were concerned that unlike her siblings and other children in the community, she was not improving but getting worse. She had multiple investigations in the regional hospital including full blood count and cerebrospinal fluid (CSF) examination (cell counts, gram stain, and culture) which were unremarkable. 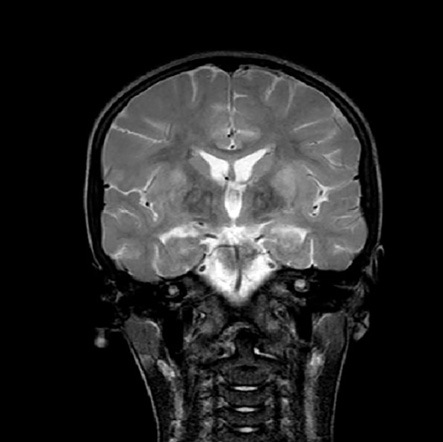 A computed tomography (CT) scan of her head was normal. The child was started empirically on intravenous (IV) ceftriaxone and acyclovir. She was transferred after two days to the Royal Hospital for further workup and neurological evaluation. At the Royal Hospital her breathing, perfusion, blood pressure, and pulse rate were normal. She was noted to be aphasic and drowsy but easily aroused. She had supple neck and her facial nerves function was intact. She had normal muscles bulk with generalized hypotonia. She had generalized weakness but was able to move her upper limbs against gravity. There were some withdrawal movements of both lower limbs to deep pain stimuli. The deep tendon reflexes were exaggerated. She had bilateral extensor planter responses. Her gag reflex was intact but due to feeding difficulties; a nasogastric tube was inserted. Lumbar puncture was repeated, and CSF examination was sent for microscopy, biochemistry, culture, bacterial antigens, and viral study (measles, adenovirus, enterovirus, and herpes simplex virus). Other samples for viral studies were sent to the Central Public Health Laboratory (CPHL) [Table 1]. Table 1: Summary of the patient tests and results. CMV and EBV DNA: negative. PCR: enterovirus, HSV and adenovirus were not detected. CSF was not sufficient for VZV, mumps, or measles test. Measles real-time PCR: RNA was not detected. *The sample was collected four weeks after rash onset and was sent for measles PCR. +Others = influenza A/B, parainfluenza (1-4), corona (63,229, HKU, 43), rhinovirus, RSV, HMPV, Boca virus, Enterovirus, par echovirus, and mycoplasma pneumonia. IgM: immunoglobulin M; PCR: polymerase chain reaction; DNA: deoxyribonucleic acid; RNA: ribonucleic acid; CMV: cytomegalovirus; EBV: Epstein–Barr virus; HSV: herpes simplex virus; VZV: varicella zoster virus; CFS: cerebrospinal fluid. Magnetic resonance imaging was performed and showed increased signal intensities on T2-weighted and fluid-attenuated inversion recovery images. The signal changes were symmetrical and involved both basal ganglia [Figures 1 and 2]. 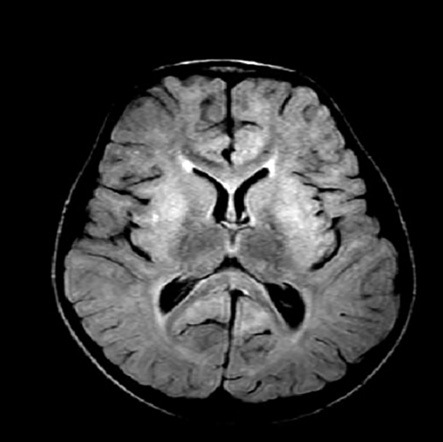 Figure 1: Axial fluid-attenuated inversion recovery image showing areas of increased signal intensities on bilateral caudate nuclei, putamen, and globus pallidus. Figure 2: Coronal T2-weighted image showing signal hyperintensities changes over putamen and globus pallidus bilaterally. Measles virus infection was supported by reactive serology and confirmed by viral RNA detection from the nasopharyngeal swab and the viral urine culture on Vero/SLAM cells. The patient also had molecular evidence of adenovirus infection from the respiratory sample, but this was negative in the CSF sample. The patient was started on empirical treatment for meningoencephalitis with a 10-day course of acyclovir and ceftriaxone. She also received vitamin A (200,000 IU daily) for two days and high dose methylprednisolone (30 mg/kg/day) for five days. With an intensive rehabilitation program, she showed gradual improvements. Five weeks after the initial presentation, she was seen at the neurology clinic and found to be back to normal with no neurological deficit. Measles is one of the leading causes of death among young children globally even though a safe and cost-effective vaccine is available. The measles vaccination has resulted in a 74% drop in measles deaths globally in the last 10 years.3 Measles is highly communicable, with a secondary attack rate among susceptible persons of more than 90%. In Oman, vaccine coverage is high. However, many people enter the country from regions where immunization programs are paralyzed due to various factors, such as the strength of health system and political problems and internal conflicts as with our reported case. Table 2: Types of measles-induced encephalitis. Rash during the early phase of the infection. Viral invasion of a neuron cell. Virus RNA can be positive in CSF. 5% in children and 25% in adults. Develop within one year of infection. Measles viral RNA detected in biopsy of brain cell. Develop 6–15 years after measles infection. Higher among children infected at a younger age. Patients decline into a coma and death. Very high titers of measles antibody in the CSF. Most individuals will die within one to three years of diagnosis. RNA: ribonucleic acid; CSF: cerebrospinal fluid.. The child in our case had features of acute post-measles encephalitis. She presented more than a week after measles infection, and the rash had already disappeared at the onset of encephalitis. In our case, both measles immunoglobulin (Ig)-M and IgG were positive. The diagnoses of measles in our patient was suspected based on the clinical presentations (fever, rash, conjunctivitis, and history of contact with a patient with similar illness), and was confirmed by a positive serology test, PCR from a throat swab, and virus isolation in a urine sample. The genotyping in this case was the D8 type, which is prevalent in Syria and this classification confirms that the case was imported and not indigenous. It is not uncommon to have other respiratory viruses in association with measles infection, like adenovirus as in this case. Quiambao9 analyzed 182 patients with measles-associated pneumonia. He found mixed infections in 53% of patients. Adenovirus (19%) and parainfluenza (25%) viruses were the most frequent infections. Because of the rarity of measles encephalitis and the small number of patients reported in non-randomized studies, recommendations on the use of steroids and immunoglobulin in the management are hard to establish. However, our patient showed an excellent response to steroid therapy with full recovery four weeks after treatment initiation. Despite 100% coverage of the national measles vaccination program in Oman, some cases will be seen from time to time, and a high index of suspicion for this disease should be kept especially in unvaccinated or partially vaccinated individuals. Encephalitis is a rare, but severe complication of this infection and the use of steroids should be considered, weighing the benefits and risks in each case until strong evidence from randomized trials is available. 1. Tunkel AR, Glaser CA, Bloch KC, Sejvar JJ, Marra CM, Roos KL, et al; Infectious Diseases Society of America. The management of encephalitis: clinical practice guidelines by the Infectious Diseases Society of America. Clin Infect Dis 2008 Aug;47(3):303-327. 2. Awaidy ST, Baqlani SA, Mahrouqi SA, Rawahi BA, Busaidi SA, Obaidani IA, et al. Progress Towards Measles Elimination: Oman Experience. SM Vaccine Vaccin. 2015;1(1):1004-1009. 3. Simons E, Ferrari M, Fricks J, Wannemuehler K, Anand A, Burton A, et al. Assessment of the 2010 global measles mortality reduction goal: results from a model of surveillance data. Lancet 2012 Jun;379(9832):2173-2178. 4. Fisher DL, Defres S, Solomon T. Measles-induced encephalitis. QJM 2015 Mar;108(3):177-182. 5. National Center for Immunization and Respiratory Diseases. Measles complication. [cited 2015 May]. Available from: http://www.cdc.gov/measles/about/complication.html. 6. Hamborsky J, Kroger A, Wolfe S. Epidemiology and prevention of vaccine – preventable disease. The Pink Book: Course Textbook. 13th Edition: Washington D.C. Public Health Foundation, 2015. [cited 2015 June]. Available from: http://www.cdc.gov/vaccines/pubs/pinkbook/index.html. 7. Tipples GA, Hamkar R, Mohktari-Azad T, Gray M, Parkyn G, Head C, et al. Assessment of immunoglobulin M enzyme immunoassays for diagnosis of measles. J Clin Microbiol 2003 Oct;41(10):4790-4792. 8. Ono N, Tatsuo H, Hidaka Y, Aoki T, Minagawa H, Yanagi Y. Measles viruses on throat swabs from measles patients use signaling lymphocytic activation molecule (CDw150) but not CD46 as a cellular receptor. J Virol 2001 May;75(9):4399-4401. 9. Quiambo BP. Coinfection is common in measles –associated pneumonia. Pediatr Infect Dis 1998;17:89-93. 10. Huiming Y, Chaomin W, Meng M. Vitamin A for treating measles in children. Cochrane Database Syst Rev 2005;19(4):CD001479. 11. Fox A. Acute measles encephalitis in partially vaccinated Adults (serial online) 2013;8:e71671. [cited 2015 June]. Available from: http://www.plosone.org. 12. Allen JE. Treatment of measles encephalitis with adrenal steroids. Pediatrics 1957 Jul;20(1 Part 1):87-91. 13. Nishiwaki T, Sawa N, Kikui S. Suspected measles encephalitis caused by modified measles that was difficult to diagnose: a case report. Brain Nerve 2011 Jan;63(1):75-78. 14. Steiner I, Livneh V, Hoffmann C, Nass D, Mor O, Chapman J. Steroid-responsive, progressive, focal measles virus brain infection. Ann Neurol 2014 Jun;75(6):967-970.